The Church of Christ, my beloved brethren, is the Divine-human Body of Christ. The Church of the Old Testament was spiritual and consisted of the righteous, who did not overcome death, but with the incarnation of Christ the Church became physical, that is it was recruited by Christ and became His Body. This was accomplished together with the Panagia, because she gave her body to Christ, who deified it and made it a church. This alone shows the great worth of our Panagia, and that she is the joy and cause of our deification. Therefore, when we say Church we mean Christ the Bridegroom, the Mother of Christ the Bridegroom, and the friends of Christ the Bridegroom, the saints. Within this communion the deification of man is achieved as well as the sanctification of all creation, and of course great changes occur in society and the world. In the sermons of the months that have past and are ahead of us, we mentioned and will refer to the Mysteries of our Church, and we saw the importance they have for our lives. There cannot be a spiritual life outside the Mysteries of our Church, especially without Holy Baptism, Holy Chrismation, and Divine Communion. But these Mysteries also involve our Panagia. The visitation of the angel at the Annunciation and the receiving of the Holy Spirit was the Baptism and Chrismation of our Panagia, because by this means she was purified according to her image and was anointed by the Holy Spirit. If we view Holy Baptism through the Orthodox perspective, not simply as a release from inherited guilt, but as the purification of the image, then we will also understand the situation of the nature of the Panagia during the Annunciation. With the conception of Christ in the womb of our Panagia one could say that the Panagia communed with Christ. The close relationship of Christ the embryo with His Mother shows that the Panagia had nine months during which she bore Christ in a constant Divine Communion. With her dormition and her bodily rise to heaven, the Panagia lived the Second Coming of Christ and the resurrection of her body. Once we recognize the great value of the Divine Eucharist we must also view the relationship between the Panagia and the Mystery of the Divine Eucharist. The important thing is that we have the great honor, during the Divine Eucharist, to commune of the Body and Blood of Christ, but we also owe this to the Panagia, because that Body of His was received by Christ from His Mother and deified it. Within this perspective Saint Symeon the New Theologian says that those who commune of the flesh of our Lord Jesus Christ commune also of the flesh of the Panagia. Even the antidron, according to one interpretation, is a blessing of our Panagia. Because the bread offered during the proskomide (offertory) recalls the Theotokos, since from the prosphoron the lamb comes out to be offered and changed into the Body of Christ, and the rest of it is offered in memory of the Panagia. The Panagia, beloved brethren, is closely linked with Christ, which is why iconographers usually depict her holding Christ in her arms. 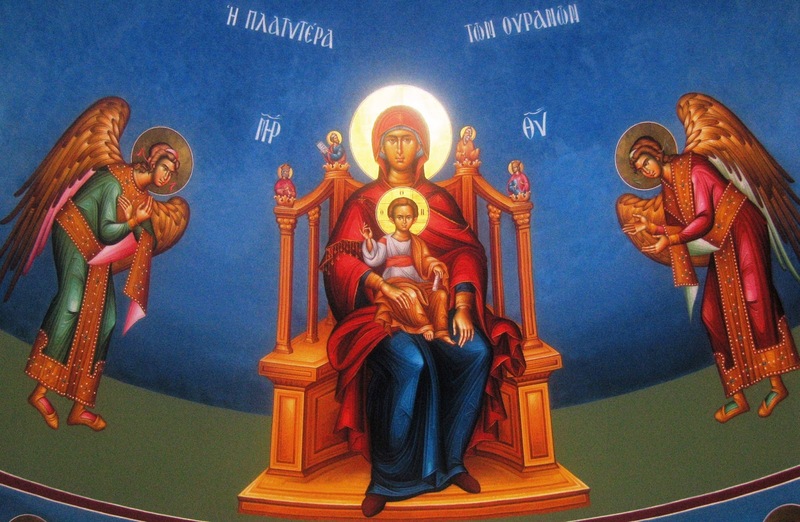 Hence the Panagia is also linked to the Church, because just as the Church has Christ as its center, so also does the Panagia hold Christ in her arms. And just as through the Church we know Christ, so also through the Panagia we are led to love towards Christ. And just as the Church prays for our salvation, so also does the Panagia pray without ceasing for us. We praise Christ who is our Savior and Benefactor, but we also glorify our Panagia who became the joy and cause of our regeneration. We abandon ourselves to her divinely-maternal heart and her philanthropy for all of us. We supplicate and plead to her to protect us, to strengthen us, and to intercede for us, for all of our lives, at the hour of our death, and especially during the terrible hour of the Second Coming of Christ. Source: Ekklesiastiki Paremvasi , "Θεοτόκος και Εκκλησία", July 2002. Translated by John Sanidopoulos.